The European infrared telescope has sent back its 1st images of the early Universe. Cosmologists and astrophysicists the world over are now looking forward to a treasure trove of data. Portion of the sky observed by Planck over a 2-week period in August. Credits: ESA, LFI & HFI Consortia (Planck), Axel Mellinger. Three months after the 1st images from Herschel, it is now Planck’s turn to fulfil its promise. Europe’s infrared telescope recently completed its first light survey of a small region of the sky. From its vantage point 1.5 million km from Earth, the spacecraft, launched from Kourou on 14 May, began observing the cosmic microwave background (CMB) on 13 August. Over a period of 2 weeks, it scanned the sky non-stop to put its instruments through their paces and verify their stability. 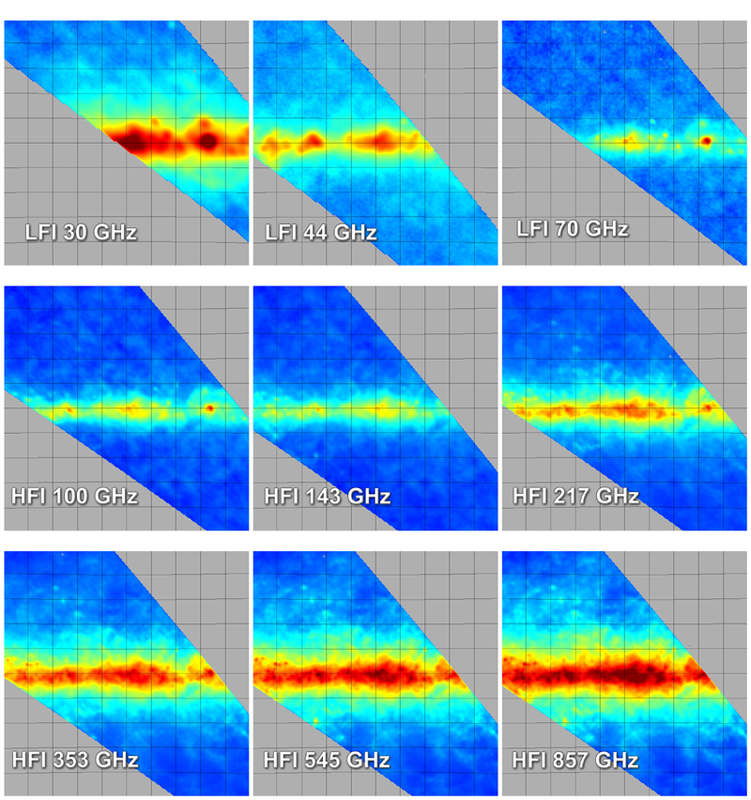 First light survey by Planck in 9 frequency bands. Credits: ESA, LFI & HFI Consortia (Planck). All the instruments are functioning perfectly and analysis of data acquired up to 27 August has produced maps of a strip of the sky in each of the 9 frequency bands in which Planck is operating. Each map is a ring about 15 degrees wide stretching across the full sky. Everything is “go” to pursue the mission. Planck will now scan the sky continuously for 15 months with a view to producing 2 all-sky maps. Planck’s mission is to precisely measure the fossil radiation of the CMB. The Planck spacecraft was launched with Herschel on 14 May 2009. Credits: ESA. Planck is set to show us what the Universe looked like 13.7 billion years ago, just 380,000 years after the Big Bang. To achieve this, it will be using a telescope with a mirror 1.5 m across and 2 ultra-sensitive instruments: LFI (Low Frequency Instrument), developed by Italy, and HFI (High Frequency Instrument) developed by France. 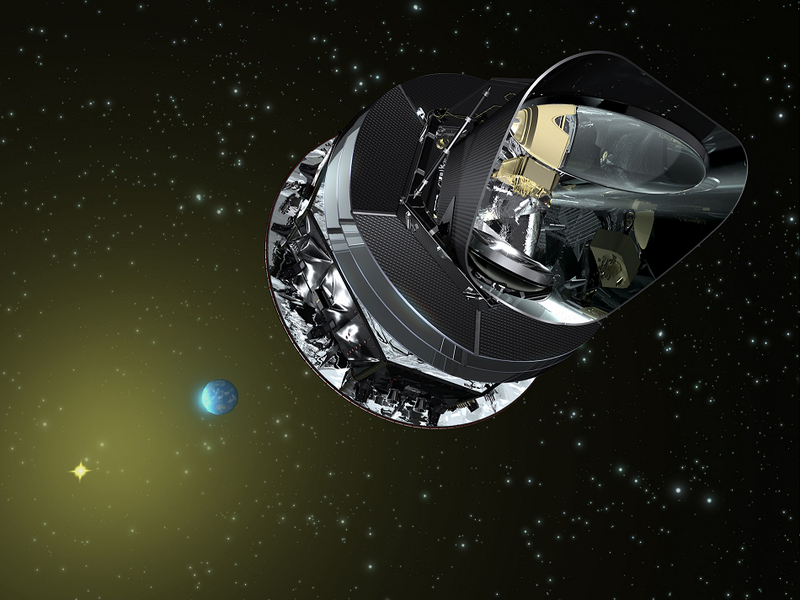 The scientific community will start receiving processed data from Planck toward the end of 2012. But before then, it will take 2 years to sift through them and extract results.